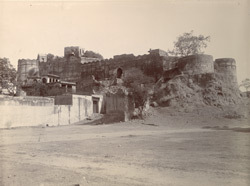 Photograph of Ballabgarh Fort near Bharatpur in Rajasthan, taken by the studio of Priyalall & Company in c.1900. This is a general view from below the west facade. The fort stands on a rocky ridge and has round corner bastions and spearhead battlements with buildings within. Ballabgarh was the headquarters of an estate owned by the Foudjar (military governor) Debi Singh, a sardar (leader) of Bharatpur State, and as well as the fort at Ballabgarh there was a palace in which he lived.